Now I feel a confession coming on...I have spurned electronic reading devices since their inception, after all books are beautiful and tactile; but I have weakened and my last two books have been read on a Kindle© app. So now I feel I have to justify myself to my readers! I think impatience is the key (plus the delightful surprise from hubby of an iPad© for Christmas). I like to keep up with contemporary fiction and I have an aversion to hardback books. The wait for my favoured authors to come into paperback has been the key prompt to the switch to electronic readers. The other advantage (and here, hubby will, I'm sure agree) is that I can read as late into the night as I want to without having to put on the bedside lamp. But as I sit here and survey my living room, (approx. 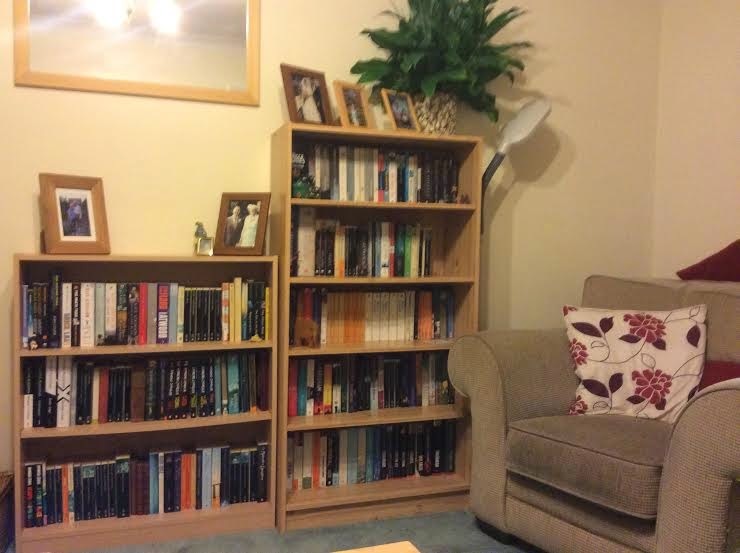 6m by 5m by my not-so-great spatial awareness), there are as many book cases as there are soft seats...It is a small space and it is dominated by books. A friend of my daughter recently commented that the latest bookcase might have been one too many, but, you see, I really like it. Books say home to me. From the shelf in my childhood bedroom that kept breaking free of its brackets to support an ever increasing collection, to the six bookcases I have managed to squeeze into our three-bed semi; books are a comfort blanket. They are reassuringly there, saying that there is a multiplicity of worlds that I can escape into when the real one is too much! I used to keep every book that I had ever read, but I have grown out of that! The result is that all the books in the house are ones I would (and do) read again. My latest reads, Elizabeth is Missing and Us have been electronic. They deserve a place on my shelves, they deserve to be lent to my friends....so I will buy them both as hard copies eventually, probably from a charity shop in six months or so. (My love of charity shops may well work its way into another post)! 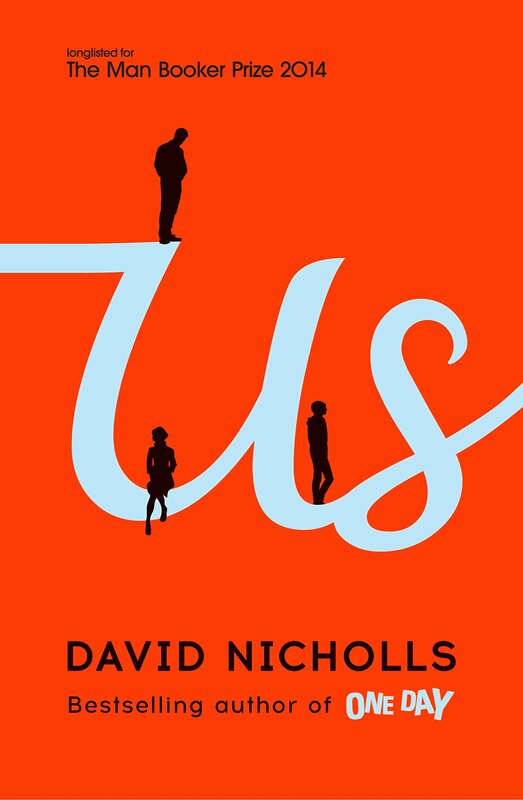 So, part of the major releases of popular contemporary fiction just before Christmas, I was eager to read Us by David Nichols. Listed for the Man Booker Prize 2014 and following his success with One Day, this title was bound to have a wide readership. I enjoyed One Day, given to me by a colleague as a gift some years ago, but I enjoyed this one more. I think, as part of my new year's resolution to make reading a priority for my leisure time, this book has benefited from being read quickly. It meant that I could fully enjoy the characterisation and the narrative. Now you know by now that I like narratives that are not fully linear. This one wove together two stories, the unfolding of a family on holiday in Europe, attempting to follow the Victorian Grand Tour of cities and galleries and that of the protagonist's past where he documented how he and his wife first met and fell in love. This is an honest novel. The central character Douglas Timothy Petersen is self effacing and really rather wonderfully ordinary. He is flawed and this is fundamentally explored through his attempts to communicate with his teenage son Albie. Humour and pathos are created as the novel develops and you realise that he has always been a little awkward with his child. The anecdote of Lego© models glued together so that they would never break illustrates his lack of understanding of his son's needs from an early age. The premise is depressingly modern and commonplace. On page 1 Connie announces "I think our marriage has run its course. Douglas, I think I want to leave you." He is blindsided by this announcement and the rest of the novel follows their path both up to and beyond this point. No spoilers as to the ending however; you need to read it to find out! The humour and characterisation, plus the easy way a reader can relate to Douglas make this an enjoyable read. The backdrop of European cities gives the novel a summer feel, despite its autumn release date! This is not a book about moral judgement. It is about people navigating their way through modern life. Coming up as book three of 2015...The Children Act by Ian McEwan.